We’ve all had times where our stomachs are rumbly and bubbly, times when you simply don’t feel very good because of something you ate or any number of other factors. While you may seem subject to the whims of your digestive tract, there are many things you can do in order to help you feel your best on a regular basis. When your stomach doesn’t feel quite right, you could pop a bunch of chewable antacids, or you could try out some of the stomach soothing recipes that we’ve collected here at the Harmony Company to make sure that you can feel your best all the time. Whenever your stomach is feeling off kilter, try this stomach calming smoothie, which may help it calm right down. 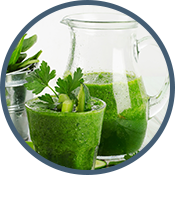 This smoothie works well to help with upset stomachs because of the aloe vera liquid. While banana and avocado are both easy on your stomach, the aloe vera liquid helps to coat the stomach and ease any spots that may be causing you discomfort from excess acidity. In addition, both aloe vera and chia seeds are demulcents, which provide nutrients that help to calm and heal the mucosal membranes in your digestive tract. Both ginger and turmeric are known to be excellent ingredients to include in foods when you have an upset stomach. Ginger helps reduce nausea, and turmeric has been shown in many studies to reduce inflammation. The combination of these two ingredients, along with the other fresh and healthy ingredients, help to calm your stomach while providing you with great nutrition. 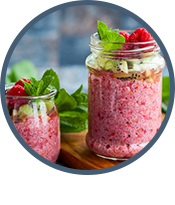 Make this smoothie each morning for breakfast, or treat yourself for a sweet and satisfying afternoon snack that has protein, fiber, and a very reasonable calorie count. When your stomach is on the fritz, it can be hard to find foods that are appealing, provide optimal nutrition, and are still easy on your stomach. 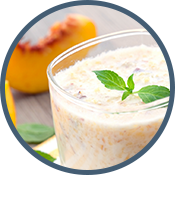 This smoothie works because it is full of fiber that can help to properly regulate your digestive tract, especially when you aren’t getting much fiber elsewhere in your diet. For a fresh, clean smoothie, this one will become your new go-to. If you struggle with an upset digestive tract, changing your diet and eating enough of the “right” foods can make a difference. So could adding a natural digestive aid by American BioSciences. Shop online with The Harmony Company today for a quality digestive aid that you are sure to love.